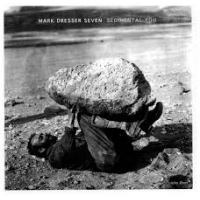 Sedimental You is the new album from Mark Dresser featuring his compositions performed by an unusually beautiful band: Nicole Mitchell (flute), David Morales Boroff (violin), Marty Ehrlich (bass clarinet), Michael Dessen (trombone), Jim Black (drums), Joshua White (piano), and Mark Dresser (bass). It is a rare treat to hear an album that sits so squarely in the tradition of jazz while still being able to sound so fresh and new. The music is deeply rooted in the tradition of ancestors like Duke Ellington while managing to evoke our strange, modern world. On the first few moments of the opening track, “Hobby Lobby Horse”, Dresser sounds more like Jimmy Blanton than ever, providing a clear rhythmic bounce that also functions melodically across odd meters that sit atop a deep groove. The opening of the title track, a play on”Sedimental You,” is as spartan and dystopian as you can imagine, while still managing to swing. Dresser turns in an achingly futuristic bitonal solo around the ten minute mark, before the delightfully surprising end. The album has an excellent sense of humor that comes through in the playfulness of the music and which is balanced by both the seriousness of the performances and by the political nature of some of the tunes. “Hobby Lobby Horse” is a “musical response to the ‘religulous’ Oklahoma-based, gigantic chain crafts store Hobby Lobby.” “TrumpinPutinStoopin,” features a “pas il Duce’ rather than “pas de deux” based on its cartoonish namesakes.” “Newton Char” is “inspired by the mass-shooting tragedies in Newtown, Connecticut in 2012 and Charleston, South Carolina in 2015…in the tradition of John Coltrane’s “Alabama.” Marty Ehrlich’s opening solo on “Newton Char” is rightly described as a “sermon,” reminiscent of Dolphy’s best work with Mingus. There are also tracks dedicated to Dresser’s friends Alexandra Montano, Daniel Jackson, and Roswell Rudd. Dresser’s abilities as a composer are on fine display across Sedimental You. The tunes are intelligent and thoughtful, with beautiful melodies that flow so well you often don’t notice just how wonderfully odd the grooves are beneath it. Much of it will make you dance, most of it will make you think. The album is endlessly surprising, turning at the most unexpected moments. The music covers a huge amount of ground, shimmering in as many colors as you can imagine, without ever feeling gimmicky. The twists and turns serve the compositions in the most logical and satisfying ways. One of the few jazz albums I’ve heard this year that is satisfying both intellectually and emotionally. One of the few that I’ll still (probably) be listening to years from now. Fewer albums of tired old standards (or new tunes that sound like them) and more albums of fresh, new, interesting music please!